I plan on going, too. In fact, I tried going on Friday when I was shopping in the grocery store across the street from the nearest Chick-fil-A to me. But when I saw the line of cars at the drive-in window, and how the parking lot was nearly full, I just went home instead. If anything, the controversy over the restaurant is increasing business for them. A lot of folks in Kentucky agree with me, apparently. They are probably also attracting curious customers who never ate in a Chick-fil-A before. Anyway, I hope to see you there! I have to give props to the folks over at The Economic Collapse Blog for all of their hard work in compiling this list, 17 signs that we are in a recession. U.S. retail sales have declined for three months in a row. The Philadelphia Fed index of manufacturing activity contracted for the third month in a row during July. Manufacturing activity in the mid-Atlantic region has also declined for three months in a row. A factory index calculated by the Institute for Supply Management has fallen to its lowest level since June 2009. The Conference Board index of leading economic indicators has fallen for two of the past three months. Only 17 percent of CEOs had a positive view of the economy during the second quarter of 2012. During the first quarter of 2012, 67 percent did. Gallup’s U.S. Economic Confidence Index is now the lowest that it has been since January. Optimism among small business owners has declined in three of the last four months and is now at its lowest level since last October. Dramatic drop in US economic growth predicted. Sales of previously occupied homes dropped by 5.4 percent during June. Sales of new homes declined by 8.4 percent during June. An increasing number of Americans are relying on high interest “payday loans” to pay the rent and put food on the table. Far more companies are defaulting on their debts this year than last year. According to the U.S. Labor Department, the unemployment rate fell in 11 states and Washington, D.C. last month, but it rose in 27 states. The unemployment rate in New York City is now back up to 10 percent. The teen unemployment rate in Washington D.C. right now is 51.7 percent. A recent survey conducted by the National Association for Business Economics found that only 23 percent of all U.S. companies plan to hire more workers over the next 6 months, down from 39 percent from a few months ago. Source: Proof the Obama Recession (or Depression) Has Begun… 17 Things. The original article also has links to articles backing up the statistics mentioned in the list. If you’re a reggae fan, you will remember that song from Third World. I’m sharing the video because it really got that hot last week, here in Kentucky. The peak day was Wednesday, when at one point it was 98 outside. Thus, for most of Wednesday and Thursday, Leive and I took refuge in the basement again. Fortunately it wasn’t so bad during the weekend—it only got up in the 80s, and today’s high was in the low 90s. It also helped that we got some thunderstorms on Friday and Saturday night. Now we are finally getting enough rain for the grass to grow again; Sunday was the first time I had mowed the lawn in two months. This morning we had another friend from our church look at the air conditioners. He concluded that a freon leak was the problem, capped the leak and put some more freon into the system; that seems to have fixed it, at least for the short run. He told me that the entire unit will need to be replaced in the near future, because it is fourteen years old, but this fix will get us through the rest of the summer, and it cost a lot less that what I was expecting to pay. The repair came not a day too soon, because Leive’s cousin Edna and her husband Mike are going to be driving here from Dallas on Wednesday night, and will stay in our house for a day or so. Sure, you could say they’re used to this kind of heat in Texas, but at least they should be comfortable in the guest rooms upstairs. Now with the A/C up to speed, we won’t have to put them in the basement, as we did with the relatives who dropped in during June. Today Jews observe the saddest day of the year, the 9th of Av. Actually the 9th of Av was yesterday, but Jewish holidays are not observed on the Sabbath; that day of the week is a holiday already. Anyway, here is a video explaining what Tisha B’Av is all about. 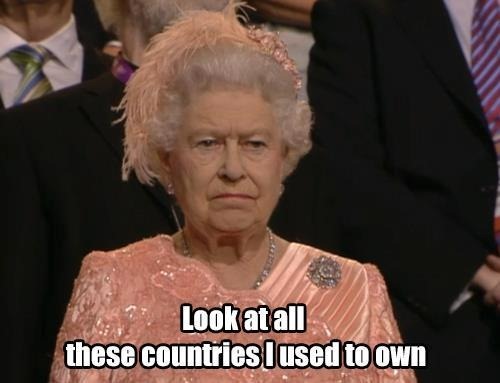 You can tell by what the Queen was thinking, as she watched last night’s opening ceremony. 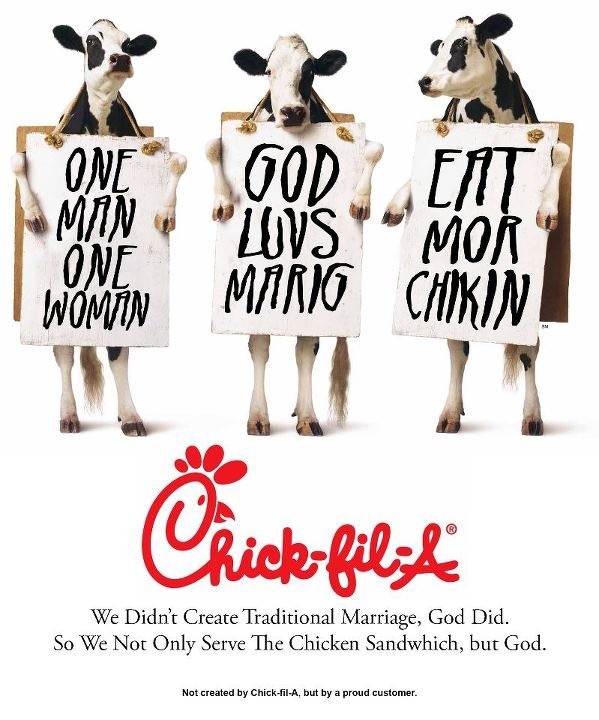 One of the news stories this week is that the management of the fast food chain Chick-fil-A announced it supports traditional marriage (one man + one woman), and it is now being criticized because of it. For me this came as no surprise. From the time I first ate in one of their restaurants I knew they were run by a Christian family, partially because they aren’t open on Sundays, and partially because on the walls of the restaurant, they post pictures of the local charities they have given food or money to, next to the ads showing cows with misspelled messages. Because of the ads and pictures, I think Chick-fil-A has one of the most cheerful atmospheres of any restaurant chain. And because they are based in Georgia, I had no trouble finding them in Florida; it seems that every community in the Orlando area has at least one. I also thought their cow calendars were hilarious, and during my last year in Florida, I got in the habit of getting a breakfast biscuit and hash brown potatoes for my daughter on Saturday morning. We don’t have as many Chick-fil-As in Kentucky, but with four in Lexington, I think they are represented well enough. You have to feel sorry for the Yankees, though; north of the Bible Belt, Chick-fil-As are few and far between. Actually, the controversy is probably a big fuss over nothing. Chick-fil-A says this won’t affect their hiring policy; it will probably only affect employee benefits and their decisions on which charities to support. Moreover, they have a practical reason. 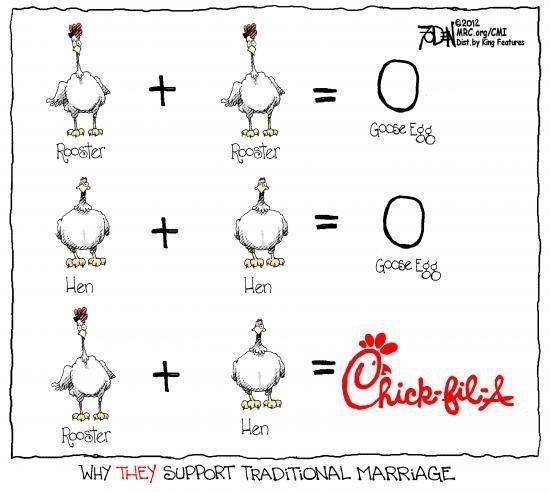 If they allowed gay marriage among the chickens, they’d run out of food pretty quickly! Finally, this is a free country. If you don’t support Chick-fil-A’s policy, don’t eat there, it’s as simple as that. Let another fast-food chain endorse gay marriage and we’ll see how they fare. Burger King, for instance; I hear they may be filing for bankruptcy soon. Would a policy promoting gay marriage be enough to save the home of the Whopper? 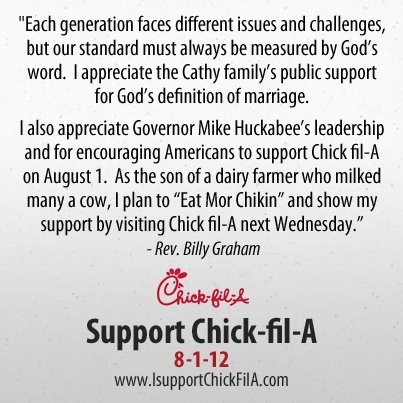 I think I will show my solidarity for Chick-fil-A by eating there this week; do the same if you agree. Especially if you live near Chicago. 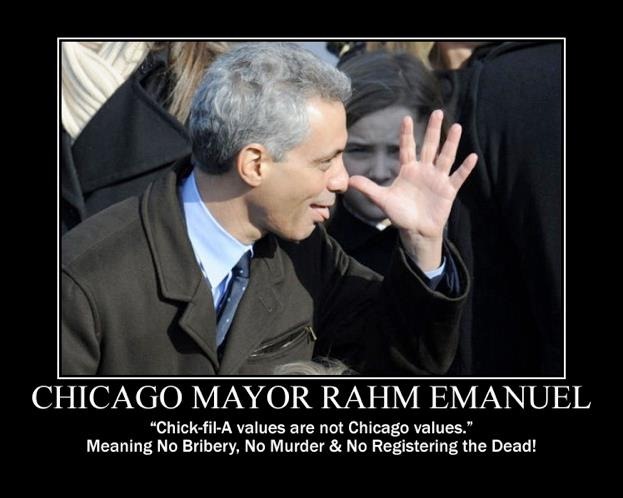 I hear that Chicago’s illustrious mayor, Rahm “Deadfish” Emanuel, has denounced Chick-fil-A for going against the city’s values; he may close the two or three Chick-fil-As in the Chicago area soon. Today I completed a revision of my Indian history series. No, I didn’t write a new paper, or update the latest one, though an update definitely is needed (I revised the last chapter in 2000). Because the papers were short compared to ones on other parts of the website, I reduced the number of chapters from six to four. To do that I combined Chapter 1 with Chapter 2, and Chapter 4 with Chapter 5. Click here to see how that series of papers is organized now. Radama had twelve wives, and the chief one, Ranavalona I, deserves attention because she was the first Malagasy matriarch to rule the whole island. The story of this queen began forty years earlier, when the uncle of Adrianampoinimerina plotted to assassinate him, and one of the king’s servants learned of the plot in time to stop it. Adrianampoinimerina rewarded the informer by adopting his daughter Ranavalona into the royal family, and when the future king Radama was old enough to marry, Ranavalona became his chief wife. However, this arranged marriage appears to have been a loveless one, for the queen had no children, and Radama liked his other wives better. Ranavalona especially resented how the royal family did not allow her to make any important decisions, so when Radama died in 1828, she abruptly seized power and killed anyone who disagreed with the idea, starting with a nephew of the late king who was the rightful heir. It took a year to hunt down all the rivals, so she had two coronations, first a traditional one in which she was annointed with the blood of a freshly killed bull, and then after all opposition was quenched, she had a more modern coronation where she wore a French-style dress. To those attending the second ceremony, she said, “Never say, ‘She is only a feeble and ignorant woman, how can she rule such a vast empire?’ I will rule here, to the good fortune of my people and the glory of my name! I will worship no gods but those of my ancestors. The ocean shall be the boundary of my realm, and I will not cede the thickness of one hair of my realm!” In 1840 she annexed Boina, thereby completing the unification of Madagascar. Those who hadn’t converted to Christianity, especially the pagan priests and much of the upper class, felt threatened by the new religion and the young educated men it produced, and Ranavalona took over with their help, so during her reign a reactionary trend set in. She cancelled the treaties with Great Britain, ended trade with the French, and ordered the missionaries to leave. Some Christians were killed in the persecution that followed, but the stories missionaries told of the atrocities in Madagascar may have been exaggerated. Most of the time she didn’t kill Christians outright, but looked for more creative ways to bring back the old-time paganism. 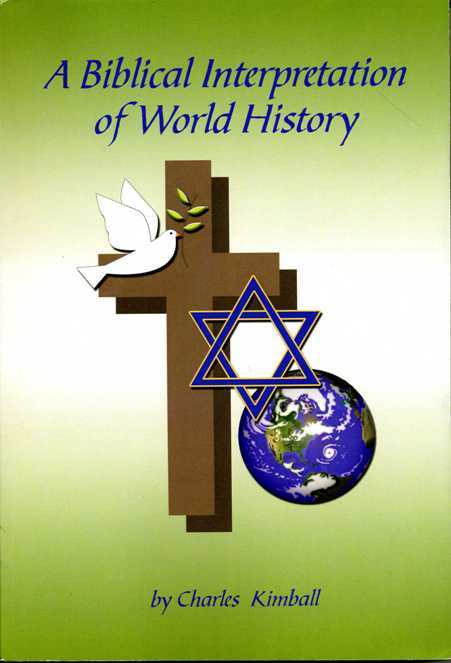 These included torture, progressive amputations, forced marches through malarial swamps, and selling Christians into slavery. On top of all that, she did away with trial by jury and brought back trial by ordeal. With trial by ordeal, the defendant was made to drink the juice of a poisonous plant called tangena, and eat three pieces of chicken skin. If he threw up afterwards, he was judged innocent; if he died or failed to puke, he was guilty. Naturally the British and the French were upset at being locked out. To show they weren’t going to go away quietly, the French bombarded and occupied the eastern port of Tamatave in 1829, and held it briefly until enemy gunshots and malaria killed off most of the troops. In 1835 a combined British-French army made a second attempt on Tamatave, and this time they fared even worse. Ranavalona cut off the heads of twenty-one dead Europeans, and stuck them on pikes on the beach facing the ocean, as a warning not to mess with her again. Europeans got the message, and stayed away from Madagascar as long as it was ruled by a “Female Caligula,” but nearby islands remained fair game; in 1841 the French took Mayotte in the Comoros (which had been conquered a few years earlier by Boina’s King Adriansouli), and Madagascar’s offshore island of Nosy Bé. Queen Ranavalona still wouldn’t yield, and suspended all overseas commerce, except with the United States. Despite all this, Ranavalona wasn’t a total xenophobe, and kept a few foreign advisors around to make the country self-reliant. The most remarkable of these was a Frenchman, Jean Laborde, who built a center for manufacturing and agricultural research at Mantasoa, near Antananarivo; eventually it employed 20,000 workers producing guns, glass, soap, silk, tools and cement. Today’s Malagasy have mixed feelings about Ranavalona I. One the one hand she successfully resisted colonialism, keeping European invaders out of her country for as long as she lived, something few African rulers could do in the nineteenth century. But it came at a terrible price, one which gave her the title “Ranavalona the Cruel.” And as with Shaka, the brutality got worse as time went on. Because of her military campaigns, deaths caused by forced labor, and her Draconian system of justice, the population of Madagascar is estimated to have dropped from 5 million to 2.5 million in the 1830s. In 1853 the Europeans paid Ranavalona $15,000 in compensation, and she lifted the trade ban, only to see foreigners, local Christians and others plot a coup against her. They wanted to replace the queen with her son, Radama II, but Radama sided with his mother, and thus was spared when the queen retaliated against the plotters. Then Ranavalona died peacefully in 1861, and Radama became king legally. However, this Radama was too peaceful and pro-European, so he only lasted on the throne for two years. He signed treaties with the British and French that gave them exemptions from tariffs and other duties, and promised perpetual friendship with France. Then he tried to remove the leaders of two prominent clans, but instead the nobility strangled him, and crowned his wife, Rasoherina, in his place.